As a girl growing up into a woman, I went through various phases of taking myself too seriously. In 2012, I frowned upon make-up, pretty dresses and song-and-dance routines in Hindi cinema. Good sense has prevailed since then, but yes, a 24-year-old me couldn’t wrap her head around “Radha on the dance floor….” That is until I actually saw Student Of The Year (2012), a movie I’d already decided I wasn’t going to like. But as hard as I tried, I just could not tear my eyes away from the screen for even a second every time this new girl appeared. This was despite the numerous cliches including slow-motion bikini shots and unreal high school romances. What was it about this actor? What made me want to watch her do this again and again? I didn’t get an answer until her second release: Imtiaz Ali’s heartbreaking directorial, Highway (2014). Here, a mere 21-year-old Alia was seen living a life full of horrors that I would imagine, she had been sheltered from in real life. This was a performance so masterful, I didn’t even realise how badly I had been waiting to watch something like this. I left the theatre in tears, unable to put my thoughts together for a couple of hours — I was feeling way too many emotions all together, but was also numb. Eventually, I began to understand why I couldn’t help but fall in love with this new actor. Alia didn’t care what you made of her. Or that’s the confidence she projected through her performances. We had in the past, seen female actors follow a predictable career path. Newcomers were considered lucky if they landed a script with a big male lead to “launch” their careers. It usually took far longer for these actors to reach superstardom. Even someone like Priyanka Chopra, who had a Miss World title, had to sign forgettable movies, perhaps because that’s what was expected of her, or maybe those movies were simply the only choices she had. Thanks to the choices Alia made early on in her career, she also created fans who waited for her movies, just to see how far she’d push herself the next time. Dear Zindagi (2016) saw Alia and director Gauri Shinde create a character who started a responsible conversation about mental health, but more stark and unexpected than that was seeing arguably our biggest superstar, Shah Rukh Khan, in a substantial part in a movie where he wasn’t the lead character. This was new, refreshing, and empowering. Alia was the start of a superstar generation of actors who didn’t believe they were royalty. She was trolled for failing to answer a question that the male stars with her on Karan Johar’s chat show couldn’t answer either. But soon after that, her appearance in AIB’s Genius of the Year sketch was a breath of fresh air. She was funny, endearing, silly and unapologetic. I suspect some of this confidence probably came from growing up around Mahesh Bhatt, or maybe it was just the sense of security film industry kids come pre-fitted with. 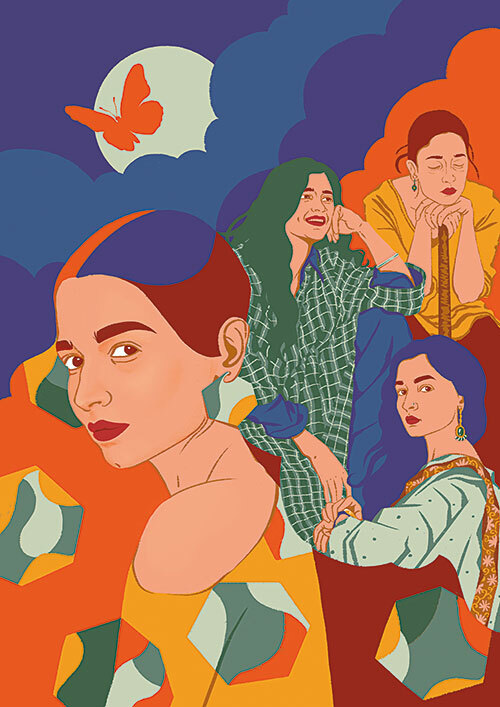 Whatever the cause, Alia wasn’t about to leave a shadow of a doubt in anyone’s mind that she would soon become one of the highest paid female actors of the industry. Alia has shown an ability to change the audience’s perception of her, without actually giving a damn about it. She lets her work talk for her. Her performance as the Bihari labourer in 2016’s Udta Punjab was a watershed moment in Hindi cinema. She had once again managed to pull off something that left me at a loss for words. She is also a perfect example of the millennial woman, and all that we kids were capable of achieving at a young age. It just so happened that I started critiquing around the same time Alia appeared in the kind of movies that she did. Notably, after Highway and Udta Punjab, nothing else was going to be good enough. I demanded performances where the female lead and her director were in sync with each other and with the story, that everything else would fall into place. And now with her performance in Meghna Gulzar’s film, Raazi, I think I finally have a handle on what it is about Alia that I can’t resist. She is a girl who chooses her own terms. Even when she needs saving [Dear Zindagi or Humpty Sharma Ki Dulhania (2017)], she’s her own catalyst, she sets the ball rolling. After all, Radha is on the dance floor because Radha likes to party.